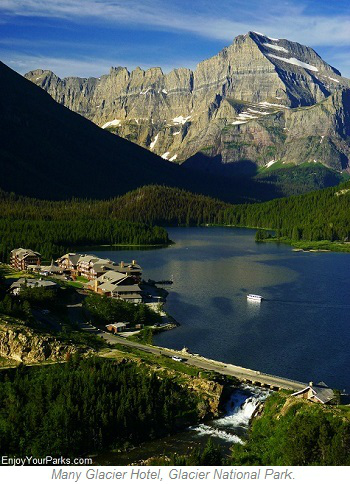 Glacier Park Hotels, Glacier Park Motels, and more. 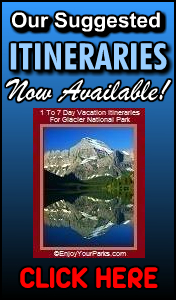 Includes Glacier Park Lodges, Glacier Park Cabins, Glacier Park Hotels, Glacier Park Motels, and more. 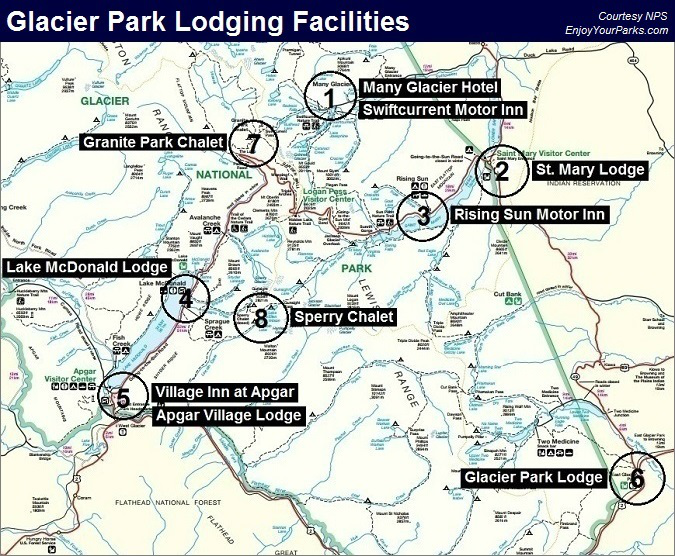 The above map shows the Glacier Park Lodging Areas. is a National Historic Landmark and is listed on the National Register of Historic Places. 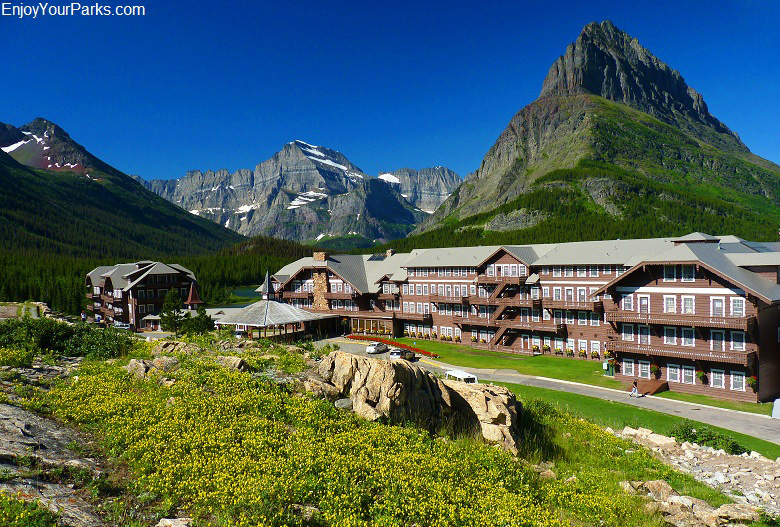 Without question the Many Glacier Hotel is one of the most popular Glacier Park lodging destinations for visitors vacationing in Glacier National Park. In addition to the incredible "Swiss-Style" architecture and preservation of its original old-world charm, the landscape surrounding the Many Glacier Hotel is possibly one the most impressive mountain scenes in the world. Nestled along the shore of Swiftcurrent Lake, to the west is a 180 degree view of some of the most impressive mountain backdrops you'll ever witness. 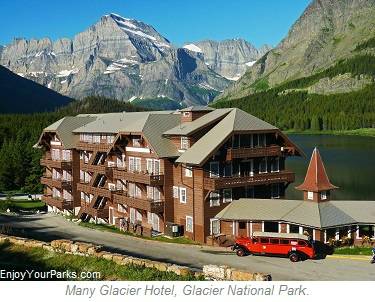 For more details on the Many Glacier Hotel, click here. The Many Glacier Area is known as "The Heart of Glacier Park" with good reason. Several of the top day hikes in North America are located here, such as the Iceberg Lake Trail, Grinnell Glacier Trail, Swiftcurrent Pass Trail, Ptarmigan Tunnel, and Cracker Lake Trail. The Many Glacier Area also provides the popular Many Glacier Boat Tour, as well as amazing wildlife viewing that includes grizzly bears. Amenities include an alarm clock, telephone, fan (upon request), iron and ironing board, wifi hotspot, hair dryer and Glacier guidebook. The Many Glacier Hotel is home to the Grizzly Track Traders Gift Shop, Heidi's Snack Shop and Expresso Stand, Information Desk, Apre's Fondue, Swiss Room (grill), Interlaken Lounge,Ptarmigan Dining Room, and David Walburn Entertainment. The Many Glacier Boat Tour is also located here, as well as guided horseback tours and Red Bus Tours. 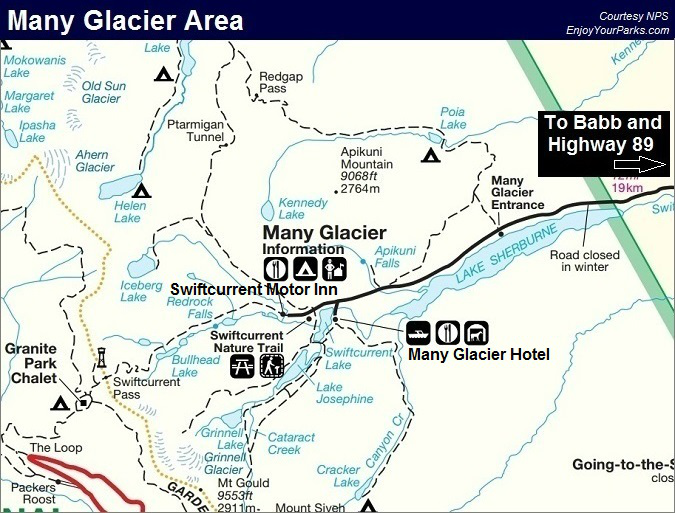 For more details on the Many Glacier Hotel and Area, click here. in 1935, and the lobby in 1941. 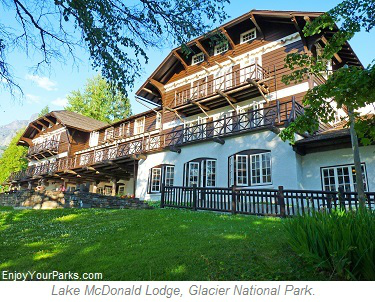 In 1955, some major construction took place to bring this popular Glacier Park lodging facility to what you see today. Listed on the National Register of Historic Places, this 88 unit Glacier Park lodging facility not only marks the end of the Many Glacier Road, but also marks the beginning of some of the most popular hikes in Glacier National Park, including the Iceberg Lake Trail, Ptarmigan Tunnel, and the Swiftcurrent Pass Trail. Surrounded by incredible mountains, the location of the Swiftcurrent Motor Inn and Cabins is extremely scenic as well as a great place to view wildlife. The Swiftcurrent Motor Inn parking lot is an extremely popular place to watch grizzly bears roam the open slopes high above the Inn during the August berry season, and quite often there will be rangers with spotting scopes at this parking lot to help visitors see these amazing animals more easily. Across the parking lot is the popular Many Glacier Campground, which makes this area an even more popular Glacier Park lodging destination. The Swiftcurrent Motor Inn rooms are divided between 3 separate buildings with outside access. And what is known as "The Pinetop Motel" has one long hallway where all of these rooms are accessed. All Motor Inn rooms are rustic but quite comfortable, and all rooms have a private bathroom, and double and/or twins beds. The cabins are duplex in style, and are arranged in a circular fashion. Most have a private bath, however some cabins do not. There is a shower and bathroom facilities nearby. The showers require tokens that are available at the front desk. For those cabins without a private bath, there is however a sink with cold running water. These rooms are rustic but comfortable, and are all smoke free. Amenities include alarm clock, hair dryer, iron and ironing board, and fan (upon request). For more details on the Many Glacier Campground, click here. 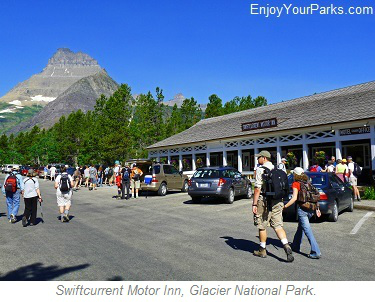 For more details on the Swiftcurrent Motor Inn and Many Glacier Area, click here. Many Glacier Area, Glacier National Park Lodging Facilities. and was acquired by Glacier Park, Inc. in June of 2011. There are 6 separate facilities that total 115 guest rooms, and these rooms range from luxurious lodge rooms and suites to rustic cabins and motel rooms. 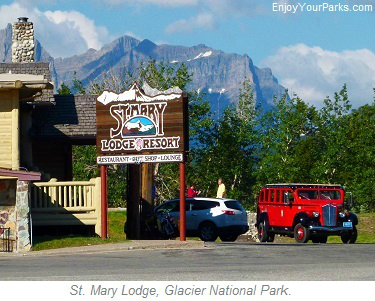 The St. Mary Lodge, Cabins and Motel are a popular Glacier Park lodging choice for visitors exploring the east side of Glacier National Park. 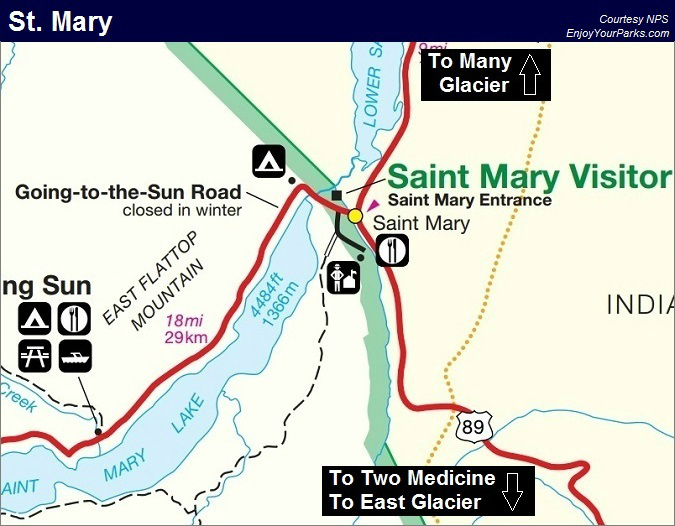 And by the way, the St. Mary Campground is located just about a mile beyond the East Entrance of Glacier Park, which is quite close to the lodge in case some of your party prefers to camp. The Main Lodge has not only a gorgeous lobby area with log decor, lounge, restaurant and gift shop, but also has 7 rooms located on the floor above the lobby. Each room has one queen size bed, desk, table and chairs, and a private bath with a shower. There is no TV. AC, satellite TV, granite counter tops, and a private deck providing spectacular views. AC, satellite TV, granite counter tops, a private deck providing spectacular views, fireplace, leather sofa bed and a Jacuzzi tub. AC, satellite TV, granite counter tops, and a private deck providing spectacular views. There is no roll-in shower. The West Motel has 24 guestrooms within a one-story building. Each room has either a king or one to two queen size beds, TV, AC, desk and chairs, granite counter tops and classic lodge furnishings. This is the only pet friendly facility in the St. Mary Resort area. This single story building has 10 guest rooms with either 1 or 2 queen size beds, desk and chair, and a TV. These cabins were built in 1937, and are located along Divide Creek. Each cabin has 1 bedroom with a queen size bed. The main room has a sofa bed, table and chairs, flat screen TV, refrigerator, and a private deck with great views. The Sun Cabins are located high on a hill to the east of the St. Mary Lodge Resort, providing incredible views of Glacier Park to the west. Each cabin has a living room with sofa bed, satellite TV, loft-style bedroom with a queen size bed, full kitchen and a large deck. Snow Goose Grille, The Mountain Bar, Curly Bear Cafe, Glacier Perk Espresso and Candy Shop, Grocery Store, Gas Station, Gift Shop, Loose Moose T-Shirt Shop, Red Bus Tours, Guided Horseback Rides, and just about a mile into the park is the St. Mary Campground. Pass. Nestled against Rose Creek and close to the north shore of St. Mary Lake, the scenery at Rising Sun is exceptional. 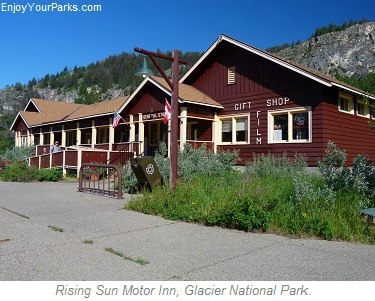 Listed on the Register of Historic Places, original construction began in 1940, and through the years additional projects have made Rising Sun the Glacier Park lodging facility that it is today. In addition to the Rising Sun Motor Inn, Cabins and Motel, Rising Sun also is just across the road from the St. Mary Lake Boat Dock where St. Mary Lake Boat Tours are provided, as well as the Rising Sun Campground and a popular hiking trail to Otokomi Lake. Red Bus Tours are also available at Rising Sun Motor Inn. The Rising Sun Area provides a total of 72 rooms, which are located in either the motor inn, the cabins, or the store motel. The rooms are rustic yet comfortable, and are true to the original "old-world charm" that was intended for visitors exploring Glacier National Park. There are some ADA-accessible rooms available. Two Dog Flats Grille, Espresso Cart, Gift Shop, Campstore, Rising Sun Campground, Showers, St. Mary Lake Boat Tours. For more details on the Rising Sun Campground, click here. Rising Sun Area, Glacier Park Lodging Facilities. built in 1895, and it became opened to park visitors in 1914. This charming Glacier Park lodging facility is one of the last remaining true examples of a Swiss Chalet Hotel in the United States. This 3-story structure has a large, open lobby that is surrounded by balconies on three sides of this grand room. The fireplace is a popular place for visitors to relax, and was a favorite hang-out of the famous Montana western cowboy artist by the name of Charles M. Russell. Visitors who were lucky enough to at the right place at the right time actually got to listen to Charles M. Russell tell stories of the old west! The lobby has many antique taxidermy mounts that were in part with the original hunting lodge, and you will find several Native American messages in the Kootenai dialect carved in the stones that make up the floor and the fireplace. Without question, the favorite past time at the Lake McDonald Lodge is to sit in a comfortable well-cushioned hickory chair or rocking chair on the incredible veranda that overlooks Lake McDonald. Below this wonderful veranda is the boat dock for the historic wooden boat Desmet, which takes visitors on a tour of Lake McDonald several times a day. Located in an "inland rain forest" setting similar to the Cascade Mountains of the northwest, Lake McDonald Lodge is surrounded by huge Cedars and Cottonwoods, which is a gorgeous setting to relax in and enjoy. This relaxing environment makes this yet another popular Glacier Park lodging facilities for park visitors. The two closest campgrounds closest to the Lake McDonald Lodge is the Sprague Creek Campground which is about a mile west of the lodge along the Going To The Sun Road, and the Avalanche Campground, which is located about 6 miles east of the lodge along the Going To The Sun Road. There are no elevators found in the Lake McDonald Lodge, but there is a bell staff that will assist you with your luggage. Each room has a private bathroom. Parking is located about 100 yards from the lodge, and all views are obscured by trees. The rooms are rustic yet comfortable, staying consistent with the "old-world" style of Glacier Park lodging. Located along a pathway that is lined with trees, the Lake McDonald Cabins are adjacent to the lodge and were constructed in the early 1900's. A few of the cabins have a small porch, and every cabin has its own private bathroom. Parking is located directly behind these rustic yet comfortable cabins. The Lake McDonald Motor Inn is located about 300 yards from the lodge, and consists of two structures that are 2-stories high. This classic 1950's style motor inn does not have an elevator, therefore access to the 2nd floor is by stairs only. The rooms are rustic but comfortable, staying consistent with the "old-world" style of Glacier Park lodging. All rooms have their own private bathroom. Some parking is available behind the motor inn, but is quite limited. Russell's Fireside Dining Room, Jammer Joe's Grill and Pizzeria, Lucke's Lounge, Campstore, Gift Shop, Red Bus Tours, Going To The Sun shuttle pickups. For more information on the Lake McDonald Lodge, click here. For information on the Sprague Creek Campground and Avalanche Campground, click here. Lake McDonald Lodge Area, Glacier Park Lodging Facilities. mountains of Glacier National Park. These rooms are rustic yet comfortable, and a wonderful beach is literally just outside your door! Apgar Village is located just inside the West Entrance to Glacier Park, and is one of the major hubs along the west side of the Going To The Sun Road. The Village Inn At Apgar is a classic 1950's style motel, and is yet another popular Glacier Park lodging facility for park visitors. There is no elevator, so the only way to the second floor is by stairs. All rooms have either double beds or two twin beds, and each room has a private bathroom. Apgar Village Lodge and Cabins, 2 Gift Shops, General Store, Camp Store, Apgar Campground, Boat Dock, Canoe Rentals, Boat Rentals, Kayak Rentals, Ice Cream Parlor, Restaurant, Visitor Center, Backcountry Ranger Station, Shuttle Stop, Picnic Area. 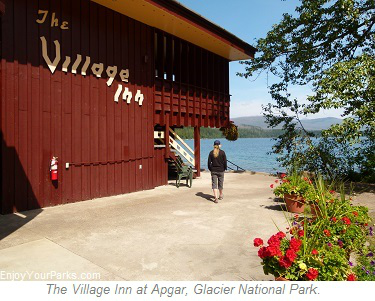 The Apgar Village Lodge is a family owned and operated Glacier Park lodging facility, and is located in Apgar Village, which is just inside the West Entrance of Glacier National Park. There are 28 rustic log and frame cabins, where 26 of these cabins have full kitchens. 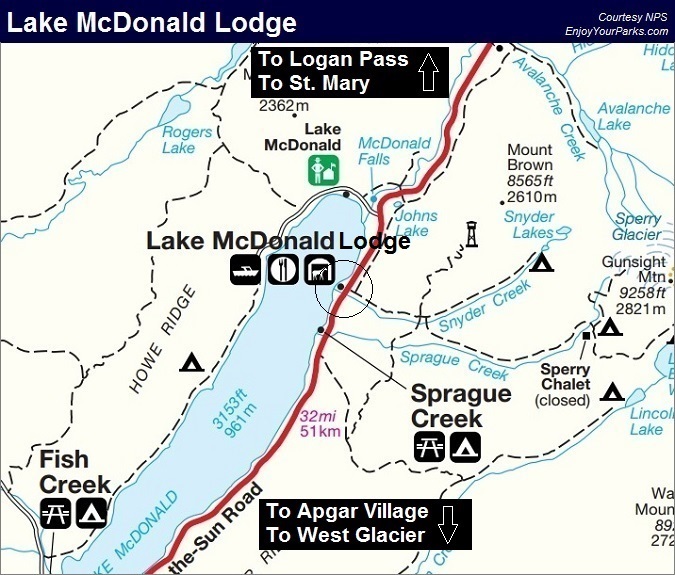 These cabins are located between the south shore of McDonald Creek and the west shore of Lake McDonald. There is also a 20 unit motel that are all non-smoking and have private bathrooms with showers. Both the cabins and motel are located amidst old growth cedars. 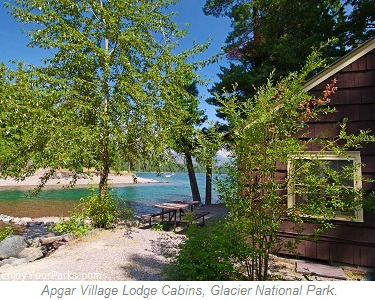 The Apgar Village Lodge and Cabins are yet another popular Glacier Park lodging option for those Glacier Park visitors who are wanting to spend time on the west side of Glacier National Park. For more information on the Apgar Village Area, click here. For more information on the Apgar Campground, click here. Lake Village, Yellowstone Park Lodging Facilities. American Lodges. 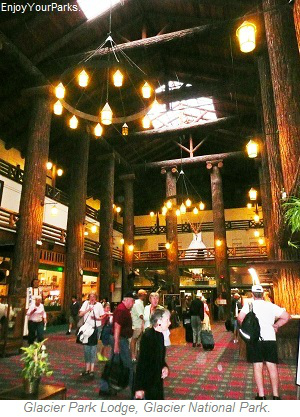 Built in 1912-1913 by the Great Northern Railway, this historic lodge is known as "The Big Tree Lodge" due to the 60 gigantic fir timbers that support the massive lobby. Each of this huge timbers were anywhere from 500 to 800 years old at the time they were cut, and they range from 36 to 42 inches in diameter and are 40 feet tall. All of these massive timbers still have their original bark. This iconic lodge is listed on the National Register of Historic Places, and is a National Historic Landmark. Seeing the breathtaking flower garden that lines the walkway between the train station and the lodge is itself worth the trip. When the flowers are in full bloom, it's awe-inspiring... even to visitors who aren't big fans of flowers! the country to Glacier Park in the early 1900's. This was a major stop, and the train station was located just east of the lodge, and is where most visitors usually started their journey into Glacier Park. Well, that train station is still there today, but instead of the Great Northern Railway, it is now used by Amtrak. These Amtrak passengers can be seen pouring into the lodge with each train stop, and is a constant reminder of how things used to be before the automobile took hold in the 1920s. East Glacier Park and the nearby Two Medicine Area of Glacier National Park was once the busiest place in Glacier Park, that is until the Going To The Sun Road was completed in 1932. The Two Medicine Area is still a popular place for hikers and for visitors taking the famous Two Medicine Boat Tour. Located about 11 miles north of Glacier Park Lodge, the Two Medicine Area is a major Glacier Park attraction. Great Northern Dining Room, The Empire Cafe, The Empire Bar, 2 Gift Shops, Swimming Pool, Golf Course, Red Bus Tours, Horseback Riding, Nine Hole "Pitch'n Putt Golf Course located on the front lawn, and Remedies Day Spa. For more information on the Two Medicine Area, click here. 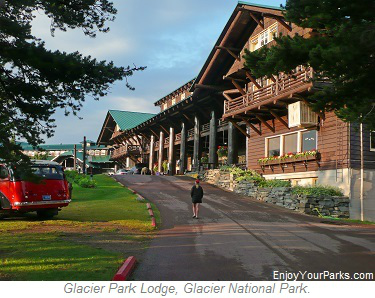 For more details on the Glacier Park Lodge, click here. Glacier Park Lodge and East Glacier Park Montana, Park Lodging Facilities. Park. Visitors would come to Glacier Park and tour the park on horseback with a large group of other visitors and guides. Each chalet was strategically placed throughout the park, eleven in all, so the visitors would eventually see all the major attractions. The average stay per visitor was over a month. Today, there are only two remaining backcountry chalets in Glacier Park- the Granite Park Chalet and the Sperry Chalet (see below), and both are National Historic Landmarks. 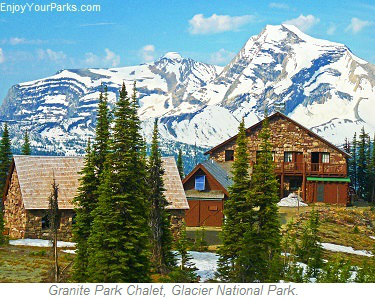 The Granite Park Chalet is located 7.6 miles north of Logan Pass along the Highline Trail. The only way to get to this remote mountain chalet is by hiking or horseback. For all the details click here. and must bring your own sleeping gear... (unless you rent fresh linens from the chalet for the night). ~There is a full service kitchen that you may use to make your own meals. ~Rustic rooms are available in the main chalet and the annex. ~There is a main dining area with several large tables in the main chalet. ~Pit toilets are the only toilets available. ~You may bring your own food to prepare, or purchase food from the chalet that you will need to prepare. There is no water available at the Granite Park Chalet. You must either bring your own, or hike one quarter mile to a stream, where you must either properly filter the water with a portable hiker's filter,or purify the water by other means such as boiling or iodine tablets. You may also purchase bottled water at the chalet. For details on the Granite Park Chalet, please click here. Granite Park Chalet, Glacier Park Lodging Facilities. 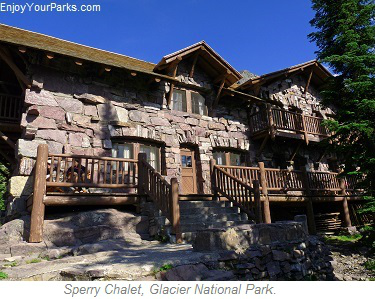 The historic Sperry Chalet is one of only two original backcountry chalets remaining in Glacier National Park. 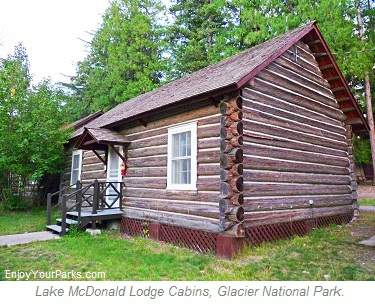 Built in 1914 by the Great Northern Railway, this was the era of "chalet touring" in Glacier Park. Visitors would take the train to Glacier Park and tour the park on horseback with a large group of other visitors and guides. Each chalet was strategically placed throughout the park, eleven in all, so the visitors would eventually see all the major attractions. The average stay per visitor was over a month. Today, there are only two remaining backcountry chalets in Glacier Park- the Granite Park Chalet (see above) and the Sperry Chalet, and both are National Historic Landmarks. The Sperry Chalet is located in the Lake McDonald Lodge Area of Glacier National Park. The only way to get to Sperry Chalet is to hike (or horseback ride) 6.4 miles up the Sperry Trail. 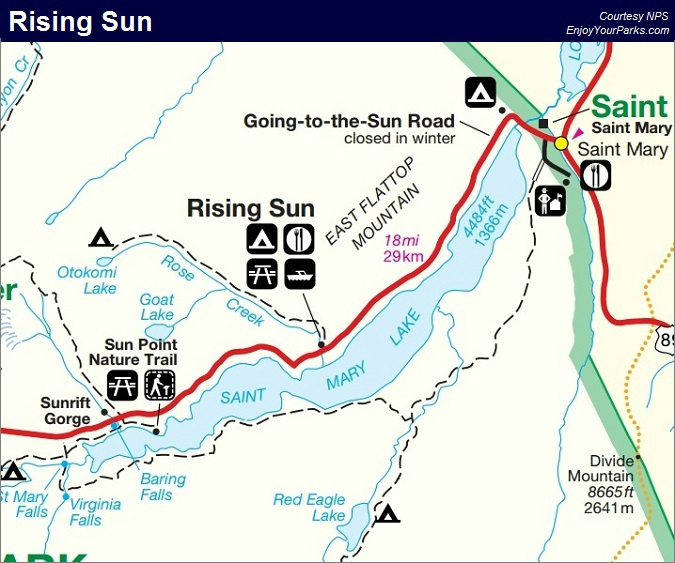 The trailhead is located just across the Sun Road from the Lake McDonald Lodge. The vertical elevation gained on this 6.4 mile hike is 3,432 feet, so this is not an easy hike. For all the details on the Sperry Chalet and the hike to the Sperry Chalet, click here. The Sperry Chalet is a "full service" backcountry chalet, which means that your meals are prepared for you (breakfast and dinner), and a sack lunch is provided as well. All bedding supplies are included, and there is also potable water available at the chalet. Running, potable water is available at the Sperry Chalet. For all the details on the Sperry Chalet, please click here. Sperry Chalet, Glacier Park Lodging Facilities. For Glacier National Park Campgrounds Click Here. For Lodging Near Glacier National Park, Click Here.